Immunofluorescence staining of adult mouse retinal section with Mouse anti Bovine rhodopsin antibody, clone 1D4 (MCA4746). 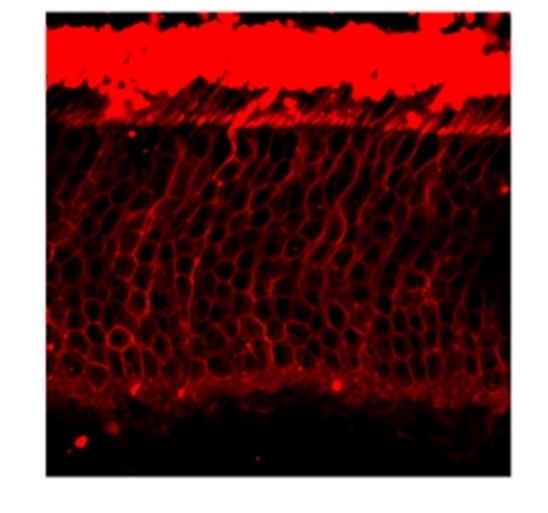 Mouse anti Rhodopsin antibody, clone 1D4 recognizes the sequence TETSQVAPA corresponding to aa 340 to 348 of bovine rhodopsin, a pigment of the retina responsible for the formation of photoreceptor cells and the first events in the perception of light. Rhodopsin consists of the protein opsin and a reversibly bound cofactor, retinal, a photoreactive chromophore. Upon light absorption the 11-cis-retinal is isomerised to all-trans retinal, leading to a change in the shape of rhodopsin. The change activates the associated G protein and triggers a second messenger cascade, eventually resulting in the transmission of a nerve impulse to the brain. The trans-retinal is released and converted back into 11-cis-retinal for re-entry into the cycle. Defects in the gene cause various retinopathies such as retinitis pigmentosa and X-linked congenital stationary night blindness. Molday, R. S. et al. (1983) Monoclonal antibodies to rhodopsin: characterization, cross-reactivity, and application as structural probes. MacKenzie, D. et al. (1984) Localization of binding sites for carboxyl terminal specific anti-rhodopsin monoclonal antibodies using synthetic peptides. Molday, R. S. et al. (1987) Peripherin. A rim-specific membrane protein of rod outer segment discs. Hodges, R. S. et al. (1988) Synthetic peptides define linear antigenic determinants recognized by monoclonal antibodies directed to the cytoplasmic carboxyl terminus of rhodopsin. Molday, L. et al. (1990) The cGMP-gated cation channel of bovine rod photoreceptor cells is associated with a 240-kDa protein exhibiting immunochemical cross-reactivity with spectrin.